886-912 For his high level of education and intellect the sixth emperor named Leo was nicknamed "The Wise". He is remembered today for continuing Basil I's legal reforms and moderate political policies which strengthened the empire. Militarily, he had to endure wave after wave of raids by a muslim faction known as the Saracens. During this time he witnessed the loss of Sicily and the obliteration of the city of Thessalonica. His personal life was also beset by the loss of three wives who were unable to bear him a male heir. Seeking to get the blessing of the church to marry a fourth wife brought into a lengthy, withering fight with various religious leaders and this eventually led him into an early grave. Still, he managed to get the consent he sought and finally a male son was born to him. He died just as he received the distressing news of the total destruction of the imperial fleet which had attempted to retake the island of Crete. Sole rule then passed to his obscure brother Alexander. SB 1725, DOC III 2 AE Follis Obv: +IHSXPSREXREGNANTIUM - Christ seated on throne facing, raising hand and holding Gospels. Rev: LEOHETCONSTANTAVGGROM' - Leo VI & Constantine VII standing facing, each holding a globus cruciger and together a patriarchal cross. 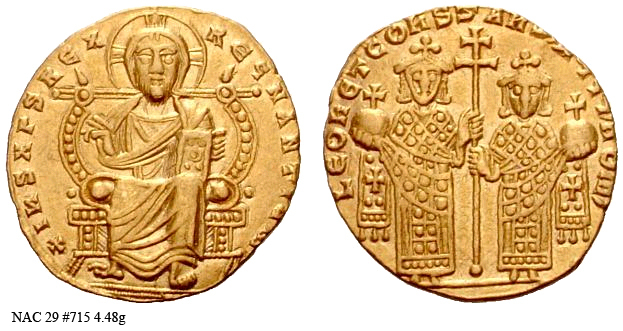 c.908-912 (Constantinople). SB 1729, DOC III 8 AE Follis Obv: Crowned facing bust, wearing chlamys and holding akakia. Rev: +L Oh/ hОё ObA/SIL VSR/OM Oh - Legend in four lines. (Constantinople). SB 1730, DOC III 6 AE Follis Obv: +LEONSALEXAnGROS - Leo and Alexander, crowned and draped, seated facing. Rev: +L Oh/SAL XAh/GROSbASIL/ROM Oh - Legend in four lines. (Constantinople).